This will be the last post about NYC. Whew! Here is a question for you. Does the below look like an "upper middle class neighborhood" to you? As the yellow sign says, this is "Rego Park". I mentioned visiting it in Part-VIII, "Asian New York". Some Wiki writer calls it "upper middle class". It seemed on the run-down side, to me. I was only in the subway station vicinity, though. The subway ride from Manhattan took around 45 minutes, as I remember. "Rego Park" was dominated by the Chinese in the late 1800s. At that time, it was farmland. The farms were bought-up by the Chinese and they sold "exclusively" [naturally...] to Manhattan's Chinatown. This should give a clue as to the timeframe of "Rego Park" Sinicization. Today, the neighborhood has a predominantly Soviet-Jewish character, with a 20% East-Asian minority, mostly Chinese. 1600s: The area is settled by Dutch and Germans, who farmed there for over two centuries. 1870s: Chinese immigrants begin buying up the farmland in the area. The Chinese start farming, "[selling] their goods exclusively to [Manhattan's] Chinatown". (Note: I've come to see that this kind of action is stereotypical of the Overseas Chinese, especially in Southeast-Asia [e.g. Malaysia]. They often seem to attract the reputation of "scheming to take over" via ethnic-networking, etc. And who likes that?). 1882: "Chinese Exclusion Act" passed by U.S. Congress, banning further Chinese immigration (lifted in WWII). 1880s-1910s: Rego Park farmland is solidly occupied by Chinese farmers. 1923: The "Real Good Construction Company" starts residential development of Rego Park (giving it its name). 1920s: Germans, Italians, Irish, and Jews begin to buy the newly-developed houses/apartments of Rego Park. 1930s-1940s: Neighborhood attracts more and more Jews; Non-Jews begin to leave. From 1940s: Rego Park is "defined by its large population of Jewish immigrants." 1970s-1980s: Rego Park becomes "a haven for Jews emigrating from Central Asia in the 1970s, when thousands of Bukharian Jews fled Uzbekistan and Tajikistan". The neighborhood thus stayed Jewish, but shifted to one with a predominantly Soviet-Jewish character, which it maintains today. 2010: Rego Park is predominantly Jewish, heavily ex-Soviet-Jewish. Other groups: 15-20% East-Asian (mostly Chinese); 16% Hispanic; 7% South-Asian; 2% Black-American (+1% Black-Hispanic). There are several Jewish synagogues. There are zero Episcopal churches. There are zero Methodist churches. There are zero Presbyterian churches. I am surprised to find one Lutheran church in Rego Park. Unlikely enough, it's of the conservative "Missouri Synod". It turns out this church is a holdover, an anachronism we might say, from the time when Protestants actually lived in Rego Park in any numbers. The congregation was organized in 1926 under a Pastor Kuechle (and If you fit this date into the above timeline, it makes sense). Here is a history of that church. 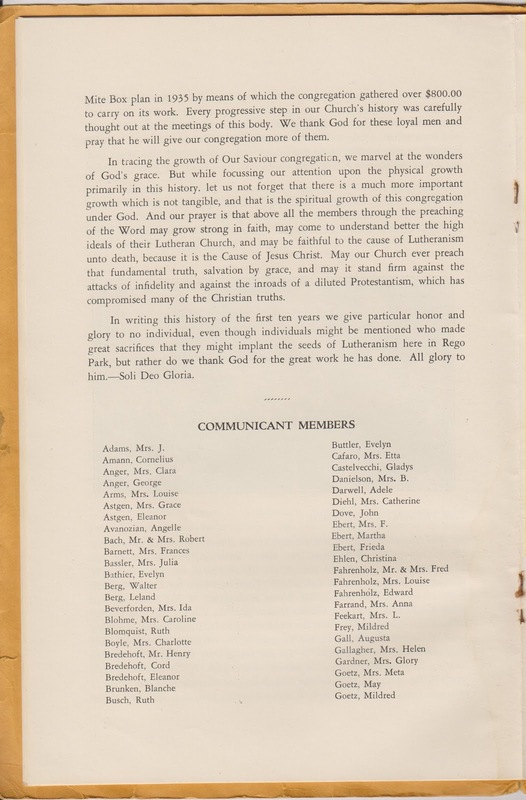 By the way, one page in that history of Rego Park's Lutheran church lists the members active in 1936. Several people surnamed Goetz are listed. I'm reminded that the famous "Subway Vigilante" of NYC in the '80s was also a Lutheran named Goetz (Bernie Goetz). Amazingly, I see that Bernie Goetz was born and raised only two miles away from Rego Park! He was born and raised in Kew Gardens, Queens in 1947. The Rego Park Goetzes in '36 very plausibly could've been relatives of his. To return to the theme of Part-II ("Feeling Provincial") and Part-VI ("The Ghost of Sherman McCoy"): In my time in Rego Park, I experienced a dearth of sights, sounds, smells, and people, with which I could identify in the slightest. Every storefront, just about, proclaimed itself "Kosher!" (except the Chinese restaurant, which I am pretty sure served pork). The streetside was peppered with Cyrillic, too. In my seven months in Germany (as a student, in 2007), I felt a lot more at-home than I felt (could feel) in a place like Rego Park, or even ("White"-)Manhattan. It's amazing how that can work. I arrived speaking quite poor German, too. It is time to put the subject of New York City to rest. To close it all up, below is a picture of me with my friend T.A. from Kazakhstan. T.A. 's financial dealing with an Uzbek resident of Rego Park is what brought us there that evening. She was a strictly off-stage villain in this drama. I didn't see her; I only heard what T.A. relayed. She herself may or may not have been Jewish, but when the phone conversation between her and T.A. turned negative (due to her own mercurial arrogance), she threatened T.A. by informing him, in Russian, that her husband is "powerful in the Jewish community" (her husband is a Russian-Jewish emigree from the '70s or '80s, I think T.A. said, i.e. a typical Rego-Parker). More ethnic aggressiveness! Poor T.A., the Kazakh-Gentile. I think he was genuinely a bit intimidated by this implied-threat. Setback notwithstanding, he recovered his optimism soon when we returned to Manhattan. Me (left) with T.A., NYC, Dec 2013. I thank T.A. for his hospitality! He took the day off to show me around, and I appreciate it a lot. What a good guy.